Nathan Benn, Gatorland, 1981. Edition of 15, $2,800. Remember our friend Nathan Benn? He has a new book out. First, you can see an engaging little mini-portfolio of his Florida pictures over at Photo-Eye. They're JPEGs of prints for sale in limited editions. Nathan's earlier book is Kodachrome Memories. I'm a big fan of Nathan Benn. From what I read about it, this is one of the most famous pictures of Bruce Springsteen, showing the singer as a young man with the Corvette he bought with the proceeds from Born to Run (and still has). It was taken by his friend Frank Stefanko, and is also one of Frank's best-known photographs. Strangely, I had never seen it before the other day, when I happened across it while researching Southside Johnny's Hearts of Stone. Frank Stefanko took the picture for the cover of that album too, among many others. Frank has had a longtime working relationship with Springsteen and with Patti Smith, and has made numerous photographs of both. The JPEG shows a rendering of an oversize limited-edition platinum/palladium signed and numbered by Frank that Morrison Hotel Gallery is currently offering for $13,000. You can read more about the picture—one of Morrison Hotel's most popular—in the listing. I've never been a big Springsteen fan, due to massive overexposure to Born to Run at the hands of my dastardly freshman dorm-mate Paul Nowosadko, who played that album a million times, over and over and over and over again, until well past the point where we all wanted to strangle him. He was too nice a guy to strangle, but we suffered for letting him live. The same situation with Blood on the Tracks caused a serious rift in the friendship of two female college friends, too; one felt that album should be reserved for reverent occasional listenings, while the other felt it should be the soundtrack for every waking moment. A serious we-need-to-talk problem. Anyway, now I'm a Stefanko fan. Richard Popham: "Brings me back.... One of my college roommates drove the rest of us crazy with Jackson Browne's For Everyman. We finally hid it on him and he bought another. But—it was his stereo." Jonathan: "It took me well into my late 30s to really be able to cope with Springsteen due to overexposure to that particular song. Though I have a massive life long aversion to Meatloaf, in particular Bat out of Hell, I was stuck on a five-hour drive with a friend once with that being the only tape on the tape deck...yes it was that long ago, it was a small car too so the music really surrounded you...I'm even feeling a little anxious just re-telling the story...."
Mike replies: ...Made me laugh. Tim Auger: "I sympathise. When at boarding school aged 13–14, I suffered Ricky Nelson. Hour after hour, day after day, week after week. Always bl**dy Ricky Nelson. I was forced to learn by heart not only the songs but the scratch noises on the vinyl LP (you call them albums, I think). Sixty years later, I still feel the trauma." Mani Sitaraman: "I first saw that environmental portrait many years ago, and it is unusual for being a double portrait, of a man and of a car (and of the man and his car), as any classic car enthusiast will recognize, instantly. With the snow and the house in the background, it adds two more dimensions to the environmental clues about the subject. But even without the analysis, you don't have to be a Springsteen or 'Vette fan to see that that's a great picture. "My other favorite picture of Springsteen is more straightforward, and is by Joel Bernstein, and is also available at the Morrison Hotel online gallery. To those acquainted with the time and place, the Jersey Shore in the late 1970s, Bernstein's picture is an instant classic, too. Tonally, though, Stefanko's image is quite a bit more interesting." an apron out of habit. Photo by Thelma Pepper. Really the perfect Monday morning story: your spirits are going to be lifted by reading about 98-year-old Thelma Pepper of Saskatchewan, Canada, arguably the purest of pure photographers. Sure lifted mine! Peter Wright: "Great pictures! This would seem to highlight once again that if you aspire to be a really good photographer, then photography itself is of secondary, or even tertiary, importance in the enterprise. In this case Pepper was interested in the people around her, especially the older women, and she wanted to tell their stories. So if you are interested in photography, first be interested in something else." Bob Cook: "Great story. Thanks for posting. For me, it's hard to carry through on projects like this one. I've tried twice, and didn't have the interest, or commitment, or passion, or whatever it is, to keep moving forward. Out of both projects I ended up with maybe two images that I like a lot; wish I had worked more diligently." Mike replies: I have the same problem, and similar regrets. Huw Morgan (partial comment): "The number one tool in a portrait photographer's arsenal is empathy!" Jim Simmons: "I struggle with the notion that a passion for a subject is necessary to fuel or inspire good work. I recall when I read this in a Bill Jay book—it made me work hard at figuring out what sort of photo project I should take on. And I came up blank (or with some really mediocre ideas). And then I thought about two of my favorite photographers, who, like I do, just go out and shoot pictures—Lee Friedlander and William Eggleston. Sure, they've both done some 'projects,' but I'd say the real essence of their work is quite simply the joy of seeing, of looking, of capturing their visual response to the world in a very personal and striking manner. "And guess what—that's good enough! I can see that some people may need more scaffolding to guide their work, but if you are simply exploring how you see, then any subject matter will do. If they do undertake a 'project,' it's more along the lines of challenging themselves to a visual problem, not a subject matter documentation. (Yes, I know, Lee has shot trees, monuments, from the inside of cards, etc., but he was more working the problem than working the subject matter.)" Since we were talking about Ornette Coleman the other day, here's the best picture of him I know of. Photographer Jimmy Katz is well known for his photography of jazz musicians—he won the Award for Excellence in Photography from the Jazz Journalists Association in both 2006 and 2011. "I think of it as Ornette exploring the universe before the rest of us," Jimmy says with a smile. "Which he did." Jimmy Katz, born in New York City, studied photography with John McKee at Bowdoin College. He and his wife Dena, originally from Moscow, have been collaborating on photographic projects in New York City in the music field since 1991, and have done over 500 recording projects and 175 magazine covers. Here's his website. Naturally, like most photographers of musicians, he's a fan too. "I explain to people that Ornette was so influential as an artist that when he accepted the MacArthur genius award he actually validated them...There was no way anybody could validate him!" Rob de Loe: "The first one is OK. The second one is simply superb!" James Weekes: "I have seen, probably, over a hundred different pictures of Ornette Coleman, and every one has been a wonderful one. He takes light at the same level as Paris." Our longtime friend Peter Turnley asked me to pass along his greetings to all his friends among the TOP readership. He's in Paris, doing well, working hard, and preparing future books and future workshops. Carl Westergren, Peter Turnley on his Paris Balcony, September 2018. "I continue to photograph every day with joy," Peter writes, "and feel very much in stride with my vision and in touch with what I want to communicate visually and open to seeing and responding very spontaneously to the world around me." Dave Karp: "I have one of his Paris photos on my wall (thanks to both of you, by the way) and was admiring it just this morning. It hangs right next to a Charles Cramer photo (again, thanks). Such different photos and photographers. Both wonderful." Maggie Osterberg: "The week I spent in Cuba with Peter is easily one of the three best weeks in my entire life. He is not only a great photographer and teacher, he's also a straight-up mensch. If you can do one of his workshops, do it. It is worth every penny and then some. It will be a transformative experience. Oh, and bring a 35mm lens and glue it to your camera!" Apologies if people didn't like the link to the Atlantic's "Abandoned Russia" portfolio. One person objected that it was stock-sourced and not commissioned, and another objected that it doesn't have single authorship or coherent focused meaning. Those are valid points of view and I'm not arguing with them. I didn't see it that way, however...I thought they were thought-provoking and good to look at anyway, despite having questionable provenance and being a motley. I liked the onion-dome church, the drowned steeple, and, really, isn't it just like humans to build a statue of an elk in a forest and then let it go to hell? The rebar showing through the legs like the wire armatures of an antique plaster child's figurine, the crumbling antlers, the slyly under-emphasized heroic perspective...I like it. I don't think I would have minded if all those pics came from across the world...they all have a sort of Ozymandias vibe and I got into it. I would have looked at that set just for the elk statue pic. But sorry if anyone thought it wasn't up to my usual standards of referral. I don't want to, you know, damage the brand. Steve Jacob: "A friend of mine travels all over the former USSR and Soviet block countries taking similar photos. It is an endless source of fascination, but it's hard to explain why exactly." This is an example of a person’s critical faculties completely deserting them. Kai sent me this shot he took with his phone on Sunday. It is of Dex carrying his kid brother Gus back to the van after a play in the park. I completely love it but this is a case of double-thick daddy goggles at work. A picture taken by my son of two of my grandchildren arrives front-loaded for me to love it. I have it as my desktop image right now, both to look at two of my favorite people on the planet and also to remind me of just how subjective the analysis of what we do can be. It feels like a strong picture to me even without the family connection, but because it is of these two I go batcrap crazy about it and any kind of critical detachment is out the window. Being only an e-friend of Mike's and not knowing Dex or Gus at all, I still think it's a very fine picture. But just knowing how Mike feels about it makes me see it sympathetically to his view of it. What do you think? Aashish Sharma: "I've commented very few times here and only when a picture shared here made me smile. This is one more of those. I'm not someone you might consider very 'discerning,' or even someone who consistently knows what he likes, but a few of the pictures you've shared here over time have triggered a really emotional reaction from me. Thanks for sharing this one. Cheers, Aashish." Speed: "It's a terrific picture. The bandage on one boy's elbow is icing on the cake. No staged shot this." grigoris: "I think that the composition is a little too tight. I would rather see the full body of the exhausted kid carried by his brother. Anyway, I like it but not much." David Maxwell: "This is the kind of picture that makes me love photography! It is packed with emotion and really conveys a sense of nostalgia for me. I would hang it on the wall and enjoy it for a long time. "The aspect ratio makes me think it was taken with a cellphone, not that I care at all because the picture is so superb. My son was born 3.5 weeks ago and I have taken almost all of the photos of him with my phone, despite using him as an excuse to buy a refurbished Canon 80D and two lenses. I definitely view all of the pictures I have taken of him through 'daddy goggles.' Ten-year-ago-me (heck, one-year-ago-me if we are really being honest here) would think that I've turned into a loser, but I'm having too much fun to care! Wow, parenthood changes everything. "My wife turned 40 on Tuesday and she loved the photo I gave her of her holding our son minutes after he was born. It was taken with the 80D and printed at 8x10. I haven't actually told her about the 80D, but if she ever does realize that it is a new camera, I will point to that picture and tell her I couldn't have gotten as good of a shot with my old (but beloved) Rebel. Not sure if it's true or if she will believe it, but it's worth a shot." Joe Boris: "Mike, before even reading your post this image just grabbed me, and I expected to find in your copy, the story of some great photographer whose work I'd like to see more of. That it is a 'phone grab' of the shooter's kids sent without second thought to another family member, in no way diminishes the impact of its emotion, gesture and beauty." Ken Bennett: "This photo stopped me in my tracks before I knew anything about it. Exceptional." Mark O: "Its the composition and subject matter that do it for me, rather than the technical aspects. Two kids, at play in the fields, one completely tired out and the other, hair blown back, Band-Aid on arm, headed home after a day properly done. Reminds me of when I grew up, when any time spent inside was considered lost time." Mark C.: "I think it works. It has the air of the classic street photo of people's backsides as they walk away from the camera, which I usually loathe, but it works for me anyway. Part of that is probably the cute kid factor, which I often like; part of it is the big outdoors/landscape, which I also usually like. And I suppose all the photo critique stuff that I might feel, but haven't much learned to quantify, must also be okay since it's enjoyable to study. (Is good near-far balance one of those photo-critique factors? It seems to have that.) From a 'photo critic' who doesn't even know the jargon." Ken Tanaka: "Well Mike Plews, I don’t have any 'daddy goggles' but I think it’s a damn fine image, one that transcends the personal family memento snapshot. Anyone who’s had a sibling should be able to immediately identify with the moment captured here. A wonderful moment of childhood, made universal by the faces being obscured. But just enough of Gus’s face is seen to convey an end-of-a-great-day feeling. Dex’s elbow bandage is the cherry on this wonderful sundae. Thanks for sharing this wonderful image with us." I've only ever seen Marilyn Monroe in one movie—Asphalt Jungle, one of my favorite noir films—and I don't think I'm big on celebrities, especially deceased ones—although I have not interrogated that. But I question who would want this ever-so-slightly motion-blurred portrait at that huge size...I think I'd be embarrassed, as such prominence would seem to betoken obsession. I'd much prefer a more modest 8x10. But then, what do I know—maybe M.M. is appropriate larger than life. Her cultural status deserves the much-overused word "iconic." Perhaps nothing in Schiller’s career proved more remarkable, though, than his collaboration with Norman Mailer—a friendship unique in American literary history. For nearly thirty-five years the two worked closely together, on books including Marilyn (1973), The Faith of Graffiti (1974), Oswald’s Tale (1995), Into the Mirror (2002), and The Executioner’s Song (1979), for which Mailer won the Pulitzer Prize. Schiller, who did much of the legwork, interviews, and research for Executioner’s Song, outmaneuvered numerous other reporters to gain exclusive access to the book’s subject, Gary Gilmore, and went on to produce and direct the award-winning television miniseries based upon it, starring Tommy Lee Jones. Ken Tanaka: "A beautiful picture, yes, but perhaps too much so for the subject. Marilyn was so over-photographed her beauty became trite. She became an icon of herself. This 'portrait' looks as if it was cropped from a larger movie scene. Naw, not my favorite. "At first glance you don't realize who it is. But unlike Richard Avedon's famous 1957 MM tweener, Schiller hasn't captured her in a sullen, dark moment that saddens the viewer. Here on the set of the 1960 film 'Let's Make Love' she appears on top of the world, as though someone's just made a clever quip. She's a person who's with you. You can almost hear her laugh. "Yes, Lawrence Schiller did some nice Hollywood work, often outside the same ol' mold." Paul de Zan: "You have never seen Some Like It Hot? Oh my." Joe: "You've never seen Some Like It Hot? Holey smoke, Mike, get on the stick!" Finnish photographer Petri Juntunen's creepy-spooky explorations of darkness are not always straight photography...he uses "novel methods of imaging and representation including 3D scanning, laser engraving and projections." He is extremely proud that his first monograph, At the Heart of It All, has just been published by Hatje Cantz. "Half a decade of work distilled into 88 pages!" he says of it. The book is available for pre-order at Amazon US, and is already shipping at The Book Depository and Amazon UK. You can sample more of the images at his website. Introduction: The tragic death of of the talented French driver François Cevert at age 29 was one of the epochal events in Formula One history, documented in books and in films such as 1: Life on the Limit and The Quick and the Dead. It ended Cevert's meteoric rise, caused Jackie Stewart to miss his last race, and crippled the then-dominant Tyrrell team. Richard Kelley, at the beginning of his 45-year career in photojournalism, was there. I was a 19-year old Indiana University photojournalism student who had been an AP stringer for Chuck Robinson at Indianapolis and begged for an AP pass to shoot the US Grand Prix at Watkins Glen. When the Glen AP editor asked if I was 21, I said, "of course." Luckily, since I had shot for Chuck, it was a wink, a nod, and good enough. I saw a story in François Cevert that October weekend in 1973. He had patiently learned all of his mentor Jackie Stewart's tricks, and he was now about inherit Stewart's leadership position as well. He confidently told Ken Tyrrell he would put his 006 on the pole. I wanted to try a different approach to capture his character at the Glen. I knew the pictures would be a perfect introduction to his 1974 season. I vividly remember standing next to him that morning in the garages; he was on top of the world. He picked up Helen, Jackie's wife, and gave her a bear hug. François seemed larger than life. At the beginning of practice, I was my usual "fly on the wall" around the Tyrrell pit, and I noticed François becoming more pensive by the minute. Something was weighing on his mind. I made a series of frames, each one with him alone and lost in his thoughts. I could tell he was replaying his "mind’s tape" of the lap, over and over, looking for a tenth here, another tenth there. I stood up and walked 90 degrees to the left, to stand in the rear of the Tyrrell pit stall, shooting him backlit with a longer lens with Helen Stewart to my left. I concentrated on isolating the men, first Ken Tyrrell and later Jackie Stewart and designer Derek Gardner bent over François, all in deep conversation concerning his setup. They formed a circle, with François in the center. As the men whispered, I raised my camera and made a frame of François's strained face focused on Jackie as he went through his ideas. I made another frame just as François looked directly into my eyes for a long moment and then, I made a final frame as his eyes seemed to look through me into the distance. Three full-framed images in all, and then I lowered my Nikon FTN. I will never forget the chills that surged through me as I looked into his vacant face surrounded by the total silence of Jackie and Derek. I could not bring myself to make another frame. A moment later, François buttoned up to leave the pits. He looked up and blew a kiss to Helen; then visor down as he slowly slipped out onto the track. I wanted to make images of him going through the Esses on the back of the circuit; something, anything to erase the memory of his thousand-mile stare. I started walking to the access point; halfway there I noticed that the engines had gone silent. It had only been two minutes. When I arrived at the Esses, I saw his car inverted atop the twisted armco; François was still in the car. Heinz Klutmeier from Sports illustrated ran up, blocking my path and whispering, "...don't go over. He's gone." I stood there and cried uncontrollably. I can't remember how long. With unspeakable horror in front of me, I couldn’t stop thinking about François' turmoil those few moments before he left the pits and the real significance of what I had seen in his eyes. I had experienced it alone, not recognizing the clue of what was to happen moments later. I felt soul-shaking sadness. This last frame has haunted me for 44 years. Had he survived, François would have just turned 73 years old. Many believe he would have won multiple F1 World Championships, and how many more Grands Prix races? Present-day Grand Prix history would be different, and François would be reflecting on his long career with his children and grandchildren. As a trained pianist, he would have been into his music, wine, and life. Today, he would be one of the giants of French motorsport and would revel in the stories that could finally be told. I can accept that being a Grand Prix driver was his dream, and he left this world doing what he loved, then. It's his missing the rest of his life that's an absolute shame, now. The photo was taken with a Nikon FTN and 200mm ƒ/4 lens at 1/500th sec. at ƒ/4, on Tri-X at ASA (as ISO was called then) 400. You can see more of Richard's excellent and dramatic motor racing work at his website. He originally submitted this picture for the "Baker's Dozen Black-and-White" feature, but I felt the story and photograph deserved its own post and Richard kindly consented. —Ed. [UPDATE Thursday 2 p.m. from Richard Kelley: "Thanks to you all for your kind words and comments. The moment I walked onto the Formula One pit lane, I knew my life would never be the same. At 19 years old, I could have gone a number of ways, but the 'decisive moment' and 'full-frame' had been drummed into my mind by Dr. Will Counts at IU, and so that was all I was searching for...sometimes I went a half hour between images, other times, it was rapid fire (for a Nikon FTN in those days). "I just felt as though I had been given the privilege of being with those gentlemen to tell their stories and having a style that was different than all the other shooters, I wanted to do it the right way through my eyes. These images have only been introduced to the public in the last four years. I've had overtures from less than sincere entrepreneurs who wanted to print a book, but wanted to return only pennies. Your words and impressions here give me the determination to carry on and someday make that presentation a reality. Manuel: "Here's a post on a subject close to my heart. Having a rather rational approach to most things in life, it's odd that I have a fervid passion for cars and motorsport, but I do. "The blue Tyrrells of Jackie Stewart and François Cevert cast such a spell on me I used to drive my father insane by incessantly asking him to give me a diecast model replica. When I got—I was nine by then—I was the happiest kid in the world. "Then the news came about the death of François Cevert. Strangely, my acquaintance with the French driver's career came through comics: Jean Graton was the author of the popular adventures of Michel Vaillant, which featured real Formula 1 drivers as well as fictional characters. That's how I got familiar with François Cevert, but also with Jean-Pierre Beltoise, Jacky Ickx, Clay Regazzoni, Jochen Mass, and some other drivers. "One of the features Jean Graton reproduced admirably in his comics was François Cevert's eyes. They were bright, expressive and intense, just like in real life. (At least as much as pictures and TV coverage allowed me to perceive them.) The picture in this entry captures that intensity in an admirable way, and in hindsight it's a rather troubling look. A bit like the last TV images of Ayrton Senna before he died, which show his anxiety and strain. Both leave us to wonder—in a rather frightening way—whether that was some kind of premonition. That's what's so disturbing—but not in a morbid manner, mind you—about Mr. Kelley's photo. "Brilliant text, brilliant photo. It's such a shame people in the US have so little contact with Formula One. It has such rich history. The only part of the entry I can't agree is when Richard states that Cevert would be one of the giants of French motorsport if he were alive. Actually, he is one of the giants of world motorsport—despite his single Grand Prix win. As with Gilles Villeneuve, Chris Amon and a few others, talent prevails over stats." Lenya: "A very sad story, very gracefully told. But my comment is also a thank you to Mike for an introduction to other Richard Kelley photographs via this guest post. The Portraits and Duos on the website are quite extraordinary, even to someone who knows nothing of motor sports whatsoever. Makes one long for a book that does not seem to exist...or does it?" Earl Dunbar: "I am not much of a car guy, and even less of a racing fan. I consider auto racing an environmental sin. But this is a great, wonderful post and an amazing story, one of the best on ever on TOP, with a most haunting image. Thanks." James Weekes: "I was at that race. A friend and I went to Watkins Glen for seven straight years. This was the last. Jackie Stewart was our hero and Francois Cevert was poised to replace him in our regard. What a loss. He was an incredibly smooth yet aggressive driver. This is a wonderful picture. "Richard's website is well worth the viewing, especially if you loved Formula 1, but if you love the look of 35mm Tri-X well interpreted, it will reward you as well." I was delighted to learn a few days ago that in the first photograph I chose for last Friday's "A Baker's Dozen: Large Format Contact Prints" (right), the model is none other than Belgian photographer Els Vanopstal, an accomplished photographer herself. In her formal work she works within a very narrow range, but she is the master of it, finding variation and modulation both emotional and visual. She uses color with great sensitivity. In a more documentary and personal vein, she also shares on her website the moving and tragic story of her partner Christophe, who died of lymphoma. Great respect to Els. When I chose Johan Verhulst's picture to lead off that post I had no idea the woman in the picture was she. As often happens on the Web it was a chance encounter, and it was a pleasure to find the world of her art through that tiny window. Thanks also to Huw, who recognized Els in Johan's picture. Have a look at her work if you get a chance. Els: "You are too kind, Mike. :-) Thank you for the feature. And of course also thanks to Johan and Huw!" Allan Graham: "Well...time out on a frantic Friday morning...and this has just stopped me dead in my tracks. Sublime and profound." As I've mentioned before, sometimes a "Random Excellence" post is just about the one picture, and sometimes it's about the photographer's work as a whole. Gyða Henningsdóttir, born 1973, is one of the latter. 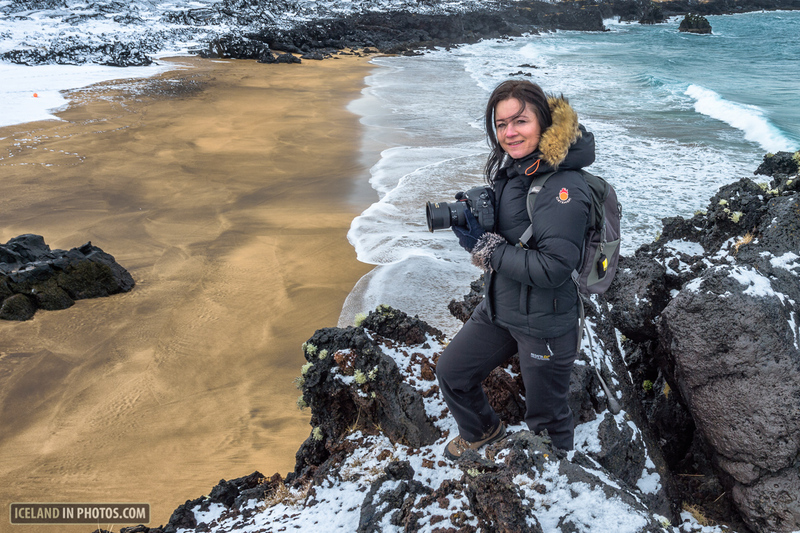 Iceland has gotten to be a popular destination for landscape and nature photographers from other places in the world; Gyda is one of the leading Icelandic photographers of Iceland. Her "about" page says she grew up photographing her family in B&W, working long hours in the darkroom, but that later her interest shifted to outdoor photography. She adds, "nature photography is not my only subject. I photograph fitness and bodybuilding competitions for fitness.is and the most popular fitness magazine in Iceland. My most fascinating subject is probably the Icelandic arctic fox. There goes one difficult subject but at the same time exciting. Wandering in the lava fields or the Icelandic mountains is the highlight of my photography so far." Her caption for the photograph above: "The White-tailed Eagle (Haliaeetus albicilla), also known as the Sea Eagle, Erne (sometimes Ern), or White-tailed Sea-eagle, is a large bird of prey in the family Accipitridae which includes other raptors such as hawks, kites, and harriers. It is considered a close cousin of the Bald Eagle and occupies the same ecological niche, but in Eurasia." Many photographers get "spectacular overload" just visiting Iceland. It must be amazing to be a landscape and wildlife photographer and live in such a small but scenic country. Here's Gyda at work. You can check out the rest of her work at her website. Mike R: "My wife and I did a self-drive tour around Iceland in June of 2016. It is everything people say about it, and often more, jaw-dropping at times. We drove counter-clockwise starting and ending in Reykjavik, with our basic itinerary and overnight stays arranged by the good people at nordicvisitor.com. "So many places to visit on our list, but this is one we'll go back to." Phil Stiles: "A marvelous body of work, well presented. Thanks for the link. I'll be going back there a few times, there's so much. Don't miss the aerials and the 'the hide.' Meanwhile, Kevin Raber has complained that Iceland has become too popular, and his latest workshop will be the last, at least for while. Cue Yogi Berra: 'Nobody goes there anymore, it's too crowded.'" Mike replies: Didn't Yogi Berra also say "I never said half the things I said"? But then again maybe he didn't. Ken Tanaka: "Some beautiful work that also conveys a lovely relationship between Einar and Gyða. My constructive suggestion to them would be to invest the time and/or money to more tightly curate their online presentation." Sæþór: "It really is a visual overload living here. Even just random trips to the hardware store often show incredible scenery of distant mountains and the ocean." I'm really looking forward to getting back to the office and into the driver's seat again—I've been back in Boston this week helping with my "Aged P" (as Dickens put it in Great Expectations). My Mom is not too terribly aged, but she has Alzheimer's. Fortunately my stepfather is home from the hospital and doing well, care is in place for the next period going forward, and I can get back to work. But speaking of pictures of people, here are some wonderful ones to look at from one of your fellow TOP readers, John Sarsgard. John spent quite a long time photographing in Cuba, which my any measure is rich territory. Even so, I suspect it's not so easy to get through the "Cuba clichés" and go a little deeper. I hope you like looking at his work as much as I did. Andrew Lamb: "Stoner is an excellent novel. Very moving." Peter: "In the interests of balance, I'm one of the few who found Stoner deeply depressing and deterministic, fatalistic even."